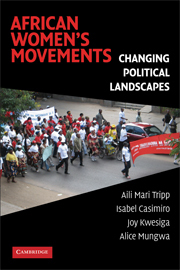 African Women’s Movements by Aili Mari Tripp, Isabel Casimiro, Joy Kwesiga, and Alice Mungwa is a slim and reachable academic work that examines the evolving sociopolitical transformation of women’s status in African societies from the 1950’s up to date. Although focusing on the case studies of Cameroon, Mozambique, and Uganda, the authors brilliantly combine data and information from the whole continent. This allows for a comparison on the complex ways in which different variables, such as a colonial past, the GDP of the country or its post-conflict situation, have a weight in the advancement of the status of women. The four scholars mix participant observer accounts, in-depth interviews, focus groups, as well as African media reports and pamphlets in order to disentangle African women’s movements and their relationship with transnational women’s networks. To accomplish their goal, the authors start the book by addressing the roots of current women’s activism, going as far back as pre-colonial times. At that time, motherhood provided African women with a framework with which to engage in political activity. However, this provoked a simplification of the definition of women’s issues and female interests as only being those related to family and reproduction. The book shows how little by little women’s associations expanded their roles to include a more developmental focus by founding credit associations, farming groups, dance groups, and mutual assistance associations. They discussed politics, farming techniques, economics, and lobbied for a greater public role. After independence, some African women joined governmental structures to push for gender reform. However, women’s organizations were often co-opted and controlled by the single party in power. This resulted in a ferrous control by the government of which type of women accessed to power and which kind of agenda these organizations would pursue. The challenge – the consequences of which are still visible today – was to find independent leaders prioritizing women’s concerns over the party. The contextualization laid down in the first part of the book allows for a great analysis on chapter 4 of the current challenges of new African women’s movements. After the 1990’s, political space opened up and women’s groups began to organize themselves and earn independent resources to employ in development. However, the authors pose fundamental questions as to how much autonomous and free these movements can be when considering the past and the current dependence on international NGOs and foreign donors. Indeed, it is thanks to the chronological way in which the book is written that the reader grasps easily the parallelism the authors try to convey – few women’s organizations in Africa are autonomous. They depended on the party in power after independence and now they need to be very attentive to donors’ activities and priorities if they are to survive financially: “women activists … are often reluctant to talk about dilemmas that they confront with donors lest they be perceived as biting the hand that feeds them” (p. 102). The following three chapters expose the successes and challenges of new women’s movements when fighting for constitutional and legislative changes, as well as for political representation and parity in governmental policies. The excellent quality of the tables and figures from all Africa provided here shows impressive data collection and data analysis skills. For all its documentary strengths, I confess to feeling a little let down by its excessively positive tone and its mere provision of data. There is little detailed explanation of how this numerical data is compared with the data provided by their interviewees and to which point the improvements in quotas and legislation are perceived as positive change by the different actors. On the same line, the book is explicit in accepting that there have been sustained improvements in women status and in the spread of gender-related international norms without questioning the usefulness of said norms: “The very fact that there is resistance to many efforts at legislative reform regarding women’s rights suggests that laws matter and that laws are not merely passed to satisfy changing international norms, only to be filed away and ignored” (p. 138). This would have been an interesting issue to unpack further in the latest section of the book. What has been the impact of the internationalization of African women’s struggles? How have gender mainstreaming policies affected the negotiation of new masculine and feminine roles? In addition, Tripp, Casimiro, Kwesiga, and Mungwa talk mainly about women in legislative positions and leader women activists, but they do not address how much women in the streets or in rural areas followed these movements or how the new achievements were felt in socioeconomically deprived areas. These omissions show some hints as to where future research should focus. This book makes a valuable contribution to the seminal literature on gender and activism by unpacking how and why women mobilized and the difficulties in enacting transformative change. In this respect, the authors’ decision to focus on the case of Cameroon, Mozambique and Uganda is particularly significant. Although the countries share a lot of characteristics, contrary to Uganda and Mozambique, Cameroon has not suffered the consequences of war in the last decades and has struggled to transform its women’s activism into positive results and governmental processes of change. This shows how much a post-conflict situation helps transform the hegemonic masculinity and embedded gender dichotomies and provides a framework of action for already empowered women who resist going back to their pre-conflict mothers and nurturers’ role. In so doing, the book challenges the assumption that democratization processes, which concede a greater role to civil society and pressure groups, are the most important condition for societal reforms. The authors also clearly identify why some legislative and constitutional reforms are so difficult to achieve while others are not. This is because there is more resistance to all measures challenging customary law, while changes relating to state and market-related institutions are accepted and even encouraged. In analyzing women’s mobilization throughout more than half a century, the book is able to explain continuous and discontinuous incremental change, providing also a first opportunity to think about the international political impact of implementation of global norms and how African women’s movements have influenced the latest global trends. The book is a must for scholars interested in social movements in the Global South, the linkages between local, national and transnational advocacy networks, as well as for policy-makers and professionals working with women and minorities in policy implementation in Africa. Maria Martin de Almagro is a Commissioning Editor for e-IR.